Nearly a year after President Obama rejected the Keystone XL pipeline, controversy over another oil pipeline project threatens to deepen divisions between two key Democratic constituencies, labor unions and environmentalists. The Dakota Access pipeline, which will carry oil from North Dakota’s Bakken shale formation through four states, has drawn vehement opposition from environmental groups. It was recently targeted by a string of arson attacks. On the other side of the fight is organized labor, which says the pipeline is a source of high-paying union jobs. Many of the unions going to bat for the pipeline also supported Keystone XL, the rejection of which drove a wedge between segments of the labor and environmental movements. The planned $3.7 billion, 1,172-mile pipeline will carry oil from the Bakken through North Dakota, South Dakota, Iowa, and Illinois. All four states have signed off on the project, and the U.S. Army Corps of Engineers gave it the final regulatory go-ahead late last month. Tensions have flared since then as environmental groups seek to block the pipeline’s construction. It was hit with three arson attacks in early August, and 12 protesters were arrested on Thursday after clashing with police. Two environmental groups, EarthJustice and Oil Change International, are leading opposition to the project, organizing online petitions asking the Army Corps of Engineers to reject it. The cause has drawn high-profile support from celebrities Leonardo DiCaprio, Rosario Dawson, and Shailene Woodley. Native American tribes along the pipeline route have also protested its construction. Media reports on the protests have framed the issue as one of individual and community interests pitted against a corporate bottom line. 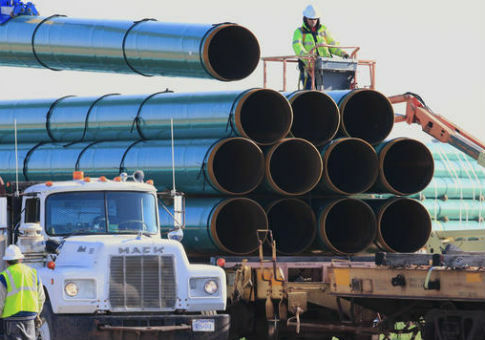 But unions representing workers tasked with building the pipeline say it represents a livelihood and a rare economic bright spot for blue collar workers. Many of those unions, such as the Laborers’ International Union of North America (LIUNA), would have built the northern leg of the Keystone pipeline, and vehemently protested its rejection by the State Department under President Obama. "For the highly skilled and trained men and women of LIUNA, projects like the Dakota Access are more than just pipelines. They are crucial lifelines to family-supporting jobs," the union said in a recent statement on its website. Energy Transfer Partners, the company building the pipeline, says the project will create between 8,000 and 12,000 construction jobs and generate about $156 million in tax revenue. Cory Bryson, the business agent of one LIUNA local, said his union has "been inundated with calls from all over the country from people wanting to work on this pipeline project. … Mainline pipeline projects like Dakota Access provide excellent working opportunities for our members and tremendous wages." According to Energy Transfer Partners, the pipeline was planned and designed to avoid many of the regulatory hiccups that doomed Keystone after years of politically charged bureaucratic delays. "Developing a project of this magnitude in this economy, under this administration, has been very difficult," Joey Mahmoud, a vice president at the company, said in May. The company avoided federal lands where possible and made a point of employing union labor. The latter strategy could revive tensions between organized labor and the environmental movement that persisted months after the State Department nixed Keystone. Those tensions resulted in a public split between billionaire Democrat donor Tom Steyer, a strident Keystone opponent, and unions that have provided political muscle for Democrats in years past. After the AFL-CIO announced plans in May to partner with Steyer on a $50 million voter turnout operation, seven member unions representing about 1.5 million workers wrote a letter to Richard Trumka, the federation’s chief, protesting its cooperation with the billionaire hedge fund manager. "Unfortunately, a growing trend within the Federation seems to consistently minimize the importance of Building Trades jobs and our members’ livelihoods in the pursuit of a coalition strategy with outside organizations that has produced mixed results at best and disastrous results at worst for our members and their employment prospects in many instances throughout the country," they wrote. Despite labor’s complaints, the Democratic Party’s energy and environmental policy positions have moved closer to Steyer since the start of his high-profile political foray in 2013. Steyer’s influence was on display at the party’s July convention in Philadelphia, where delegates adopted a platform reflecting many of his priorities. "We support President Obama's decision to reject the Keystone XL pipeline," the platform states. "As we continue working to reduce carbon dioxide, methane, and other greenhouse gas emissions, we must ensure federal actions do not ‘significantly exacerbate’ global warming." Democratic energy policy positions have already affected some of the party’s 2016 efforts. Incumbent Sen. Rob Portman (R., Ohio) has peeled off a number of labor union endorsements from Ted Strickland, his Democratic opponent, due to Strickland and his party’s position on coal-fired power. This entry was posted in Uncategorized and tagged Democratic Party, Energy, Oil, Tom Steyer, Unions. Bookmark the permalink.